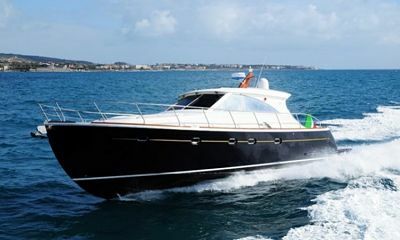 Boating is a wonderful hobby and way of life for many of us. As we travel between interesting ports of call and enjoy beautiful days on the water, risks and potential dangers do exist that every captain and crew should be ready to handle. It is a crucial responsibility for captains to hope for the best, yet be prepared for the worst. In the case of a guest or crew member going over the side, having an MOB (man overboard) plan can save a life. The possibility for us to lose our footing aboard a vessel of any size at port or underway is very real, even for the saltiest of sea legs. The dangerous misconception is that extreme weather conditions produce the greatest number of MOB situations. In reality, statistics tell us the majority of overboard incidents occur on calm seas, aboard vessels of less than 22 feet with victims who are males who cannot swim. The numbers also point toward the combination of fishing and alcohol consumption as factors in a startling number of MOB fatalities. Slippery decks from dew, spray, swimmers climbing on and off, rain, dust, or even bugs. Unexpected wakes from passing vessels or building seas. Distractions while moving along decks such as a shout, an interesting object in the distance, or clothing getting caught on protruding hardware. Sudden changes in direction by captain due to mechanical difficulties, deadheads or fishing net avoidance, wake cutting, or other emergency maneuvers. Low gunwales where guest leaning, reaching, or leveraging (such as in fishing) against a low side can cause loss of balance and a fall into the water. Excessive alcohol consumption and loss of balance and judgment. Moving about decks without using secure handholds. One hand for you, one hand for the boat! Captains and crew should establish an MOB process in the unfortunate event of a crewmember or guest going overboard. An effective plan includes five steps. Loudly call out “man overboard!” when a person is known to have fallen off of a vessel either at rest, at anchor, or underway. The captain should immediately respond by pushing the MOB button on their electronics (if applicable) and maneuver their vessel appropriately for a return back to retrieve the person in the water. Depending on whether operating a sail or powerboat, this will entail strategies such as a Quick Stop, a simple neutral and recover procedure or other maneuver depending on the water, weather, and victim conditions. A spotter aboard the vessel should visually locate the person in the water, point to the victim, and maintain constant eye contact with them. A life saving floatation device should be thrown into the water, such as a life ring buoy or a Dan Buoy (floating stand with a flag atop a vertical pole). Additional items that float should also be thrown overboard, in effect creating a paper trail to mark the victim’s location. Do not permit another crewmember or guest to jump in after an MOB victim. As the captain safely circles back for the recovery, remaining crew should prepare to approach the MOB victim and haul them aboard. The technique used by a captain to safely retrieve a fallen crewmember or guest depends largely on the situation of the fall, weather conditions, experience of the captain and condition of the fallen person. The following are common maneuvers for a safe and effective recovery. Immediately sail on a beam reach heading away from the COB for the minimum distance required to execute the technique. Head up to a close-hauled point of sail and prepare to tack. Continue bearing away and head down to a deep broad reach. Cross your beam reach wake line until you are downwind from the COB. As soon as the COB is aft of your beam head up to a close reach. Approach the victim on a course of approximately 60 degrees off the wind, fish-tailing the boat, if necessary to further slow boat speed. Luff your sails and approach the COB at the minimum speed necessary to maintain steerage. If you need more power, trim the mainsail appropriately. Establish contact with the victim on the leeward side of the boat. 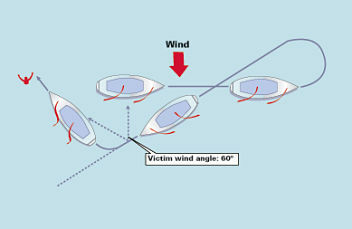 Immediately bring the boat through a hove-to position and continue turning through to a broad-reach, cleating and allowing the jib to be "backed" and further slowing the boat. Continue to turn with headsail backed until wind is abaft the beam. Course is stabilized on this beam-to-broad reach for two or three lengths and then altered to permit a close reach final approach. Keep the mainsail centered (or nearly so), thus stalling the boat. After the jibe is performed, the jib should be luffed. 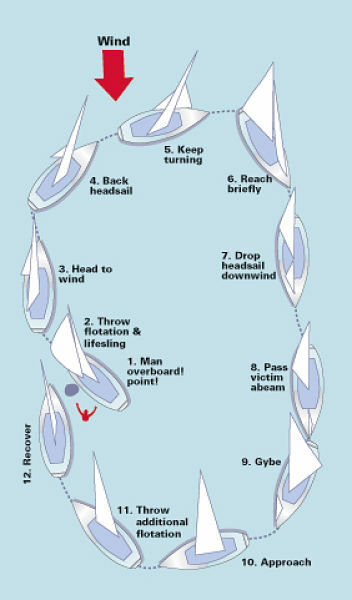 Hold the downwind course until victim is abaft the beam and pass through a jibe. The jib will now be on the "normal" side of the boat. Approach the victim on a course of approximately 60 degrees off the wind, fish-tailing the boat, if necessary to further slow boat speed. When heading about 20 degrees short of the reciprocal, put the rudder amidships so that vessel will turn onto the reciprocal course. Bring the vessel upwind of the person, stop the vessel in the water with the person alongside, well forward of the propellers. Successfully implementing a plan to recover a crew member or guest who has fallen overboard also depends on practicing and communicating the process. Planning an MOB drill helps both the captain and crew to act quickly and effectively if a true MOB emergency occurs. Using a floating object to simulate a fallen guest and initiating the five-step plan above is a good preparation for this life-threatening emergency. It is also critical to include an overview of the procedure with guests as they may find themselves aiding the captain in the recovery process. Keep in mind that MOB emergency equipment must be kept in an obstruction free and easily accessible location. In the unfortunate event that a crew member or guest falls into the water, time is critical. Digging through a lazarette, storage locker, or under piles of stowed canvas beneath a bow seat can waste precious moments. The number of variables in a MOB situation demand flexibility, experience, and quick action on the part of a captain and crew. Although responsible preparation cannot prevent accidents, it greatly affects the likelihood of a positive outcome. Establishing a plan, practicing the procedure, and communicating emergency precautions with boating guests support safety on the water.